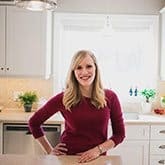 So quite a while back, in the summer, I polled my Facebook group (I’d love for you to join!) about their favorite dessert flavor combinations. And even though it was the middle of summer, apple cinnamon was easily number 1. I was a little flabbergasted! I absolutely expected chocolate to be #1, and if not chocolate then for sure lemon, right? 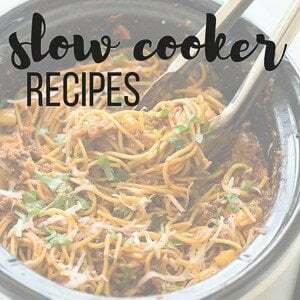 But I love the feedback I get there and so I’ve definitely been planning for some more apple cinnamon recipes this fall. With my intense loving for “apple-crisping” everything, this really wasn’t much of a stretch! I already have Apple Crisp Doughnuts, Apple Crisp Pancakes, Apple Crisp Cinnamon Buns, Apple Crisp Cookies, Apple Crisp Cheesecakes and even though I have like 18 more I’m going to stop there because it’s getting to be ridiculous. So I figured I would try to do apple without the crisp this time. I know, it’s going to take some time for you to adjust but I do have donuts, so I think you’ll get over it just fine. I really wanted to try to use the brown sugar glaze from these Brown Sugar Pecan Cookies (because they’re amazing! ), and I love the way it pairs with apples! So perfect for that bucket of apples! I use these donut pans from Wilton and they are cheap and work perfectly! I’ve never had any issues with sticking. The easiest way to fill the donut pan is to put the batter in a large disposable piping bag — there’s no mess and you can just chuck it when you’re done! I buy them bulk because I use them for everything! 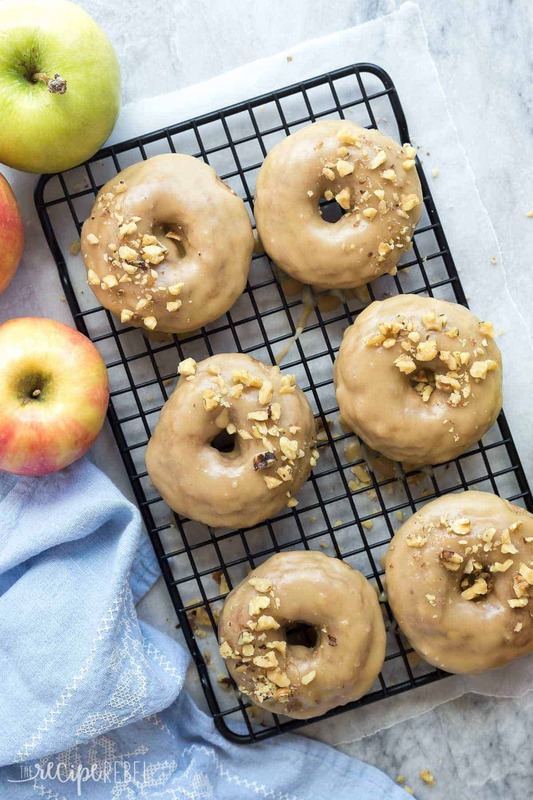 These Apple Cinnamon Baked Donuts are packed with apples (healthy, right?!) and cinnamon -- the perfect fall treat! Smothered in a brown sugar glaze that makes these a decadent dessert or special breakfast ? 1/2 cup chopped walnuts or pecans if desired. Preheat oven to 425 degrees F and grease your doughnut pans well. In a large bowl, combine butter, oil and sugar. Add in eggs, vanilla, and buttermilk and whisk until smooth. Add flour, baking powder, baking soda, salt, and cinnamon and stir just until combined. Stir in apples. Batter will be thick. Spoon batter into a large disposable piping bag or freezer bag. Cut off the end of the bag so your opening is about ½-3/4” wide. Pipe batter once around each doughnut hole – the batter should just fill the hole as they’ll expand and rise. Bake for 7-8 minutes until a toothpick inserted comes out clean. Let cool 10 minutes before removing from the doughnut pan to cool completely. GlazeIn a medium pan, heat the brown sugar and milk over medium heat until it comes to a boil. Boil for 3-4 minutes, then remove from the heat and stir in the butter until melted. Whisk in the powdered sugar until smooth. Working quickly, dip the tops of each donut in the glaze before inverting onto a wire cooling rack. If the glaze firms up too quickly, simply reheat over low on the stove until liquid, then remove from the heat and continue glazing. Sprinkle with walnuts or pecans if desired. In a medium pan, heat the brown sugar and milk over medium heat until it comes to a boil. Boil for 3-4 minutes, then remove from the heat and stir in the butter until melted. 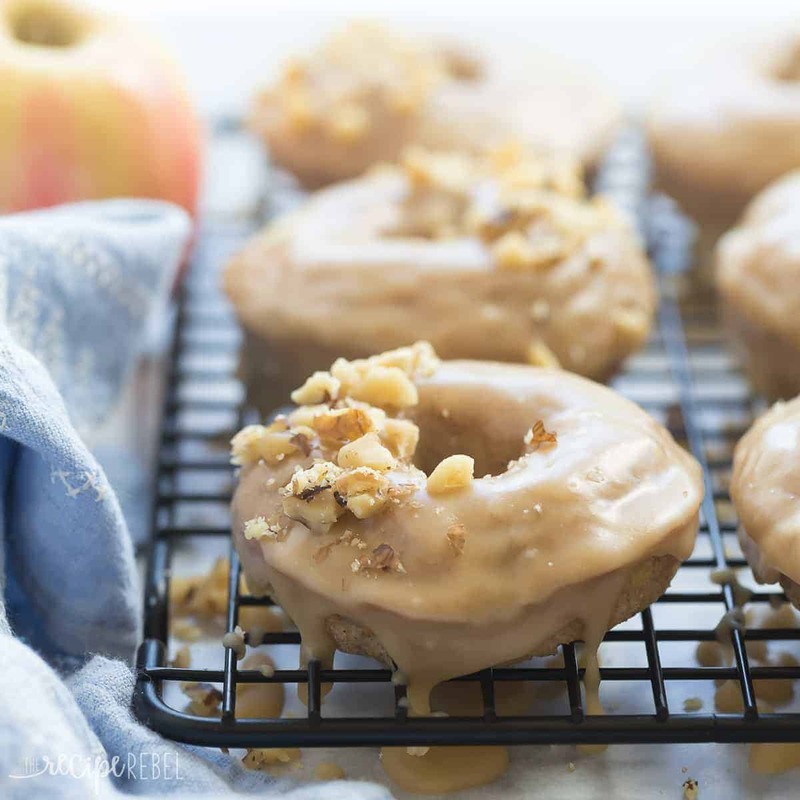 My glaze seeped into the donuts – do you have any tips to prevent that from happening? That will happen after some time or if they are covered tightly and stored — the donuts are definitely best glazed just before eating. Can you use whole wheat flour instead of white flour? I think that should work fine! hi! should i wait for the glaze to set? if so how long does it take? thanks! Yes, it will definitely set! It shouldn’t take too long at all, maybe a half hour? Directions say nothing about adding cinnamon, lemon zest or apples, why? I’m so sorry about that Dorothy! It’s all fixed now. It looks so greasy!!! I absolutely can’t live without sugar donuts!!!! 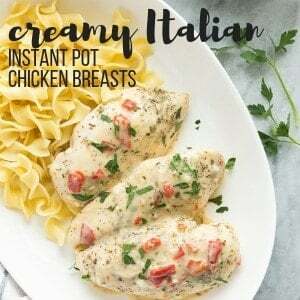 Ashley these look so good and that glaze!!! I want these with my morning coffee! Oh my goodness. As soon as my kitchen reno is finished and I can actually bake again I’m trying these. And probably eating six of them with a cup of hot apple cider. So, um. Could you like deliver this ENTIRE batch to my house right now?? You’ve totally just given me the HUGEST donut craving, Ashley! 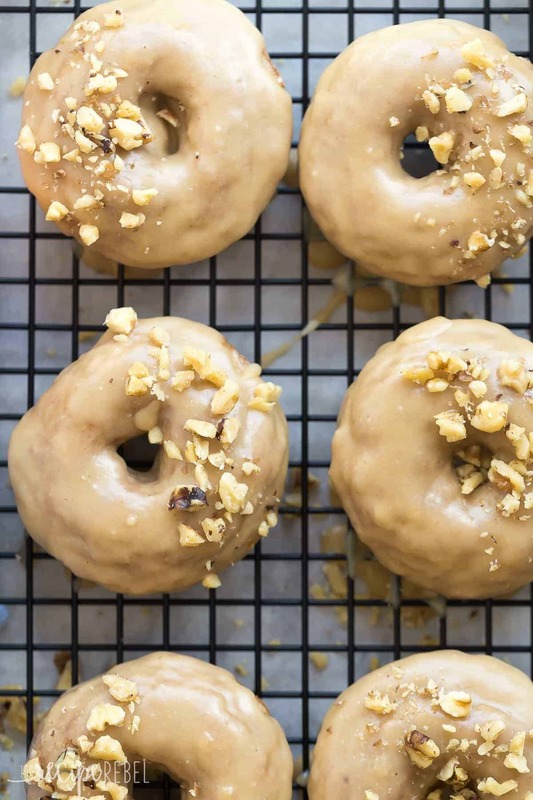 I can’t even stand how amazing these look and that GLAZE = swooning. Apple cinnamon is the best combination in my eyes, especially when fall rolls around. 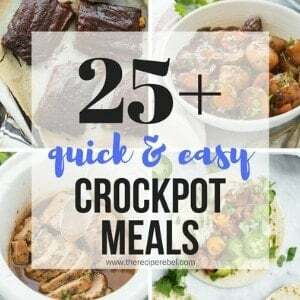 I’ve made a similar version, but with apple cider, so I am loving your creation, Ashley! And brown sugar on top? YUM! Just what I need on this chilly Thursday morning! 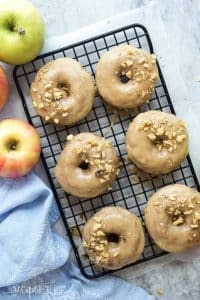 I’ve never made apple cider donuts but I need to try them! I just love apple cider this time of year. So comforting! Apples for sure outweigh the whole delicious glaze on these!! What a way to start the day! Oh my that GLAZE!!! These donuts are calling my name!! I love all your apple crisp creations, so creative!! 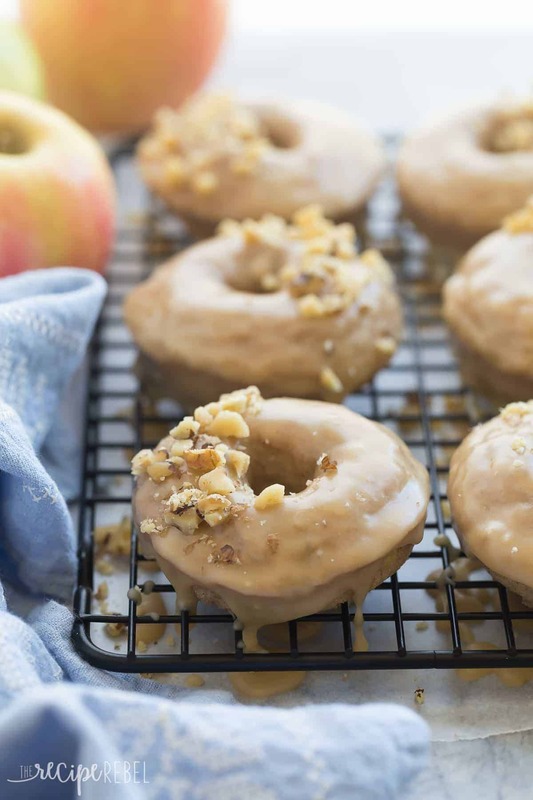 Apple cinnamon is definitely high on my favorites list too and so are donuts 🙂 These looks SOO good! I love the brown sugar glaze on these! I’m about to eat my breakfast and definitely wish I was having a few of these! Love the brown sugar glaze! I’d love a couple donuts with a big cup of coffee! Hi Ashley! I have Wilton doughnut pans too! And I have been all about apples lately, in the last week a made apple cookies and big apple cake. I think apple donuts are in my future! I hope so! I hope there are many more donuts in my future 😉 Thanks Dorothy!